FTP is insecure because all commands, usernames, password, and data transfers in the clear. Anybody sniffing the network can easily peek into an FTP session. Let’s thwart that attempt by encrypting our FTP server with an SSL/TLS certificate that we generate ourselves. SFTP and FTPS: What’s the Difference? If you see “Insecure server” when you connect to an FTP server, it means all data, including your login password, is transferred in the clear. No protection. This is normal for FTP, which was developed in the past when people held hands around campfires and trusted each other. There are two ways to encrypt an FTP session: SFTP (Secure File Transfer Protocol) and FTPS (FTP with SSL/TLS). Both encrypt, but they do so in different ways. Where the ‘S‘ is located in FTP makes a big difference in how we configure ProFTP. This is FTP using SSH port 22. Just think of it as a secure shell connection. No certificate generation is necessary. If you have an SSH server running, then you can connect. With an FTP client, you will be limited to FTP transactions. However, everything is encrypted just as it would be with an SSH login. This technique requires generating an SSL/TLS certificate that the user must accept upon login before the connection is allowed. This does not use port 22 unless you configure ProFTP to use that port. The FTP session is encrypted just like an HTTPS session using SSL (Secure Sockets Layer) / TLS (Transport Layer Security). As far as encryption goes, both work well. There is no need to be concerned that one technique is inferior to the other. The bigger issue is FTP client compatibility. When using SSL/TLS certificates with FTPS, FTP clients that lack SSL support will not connect. The default command-line ftp program will not work with FTPS. 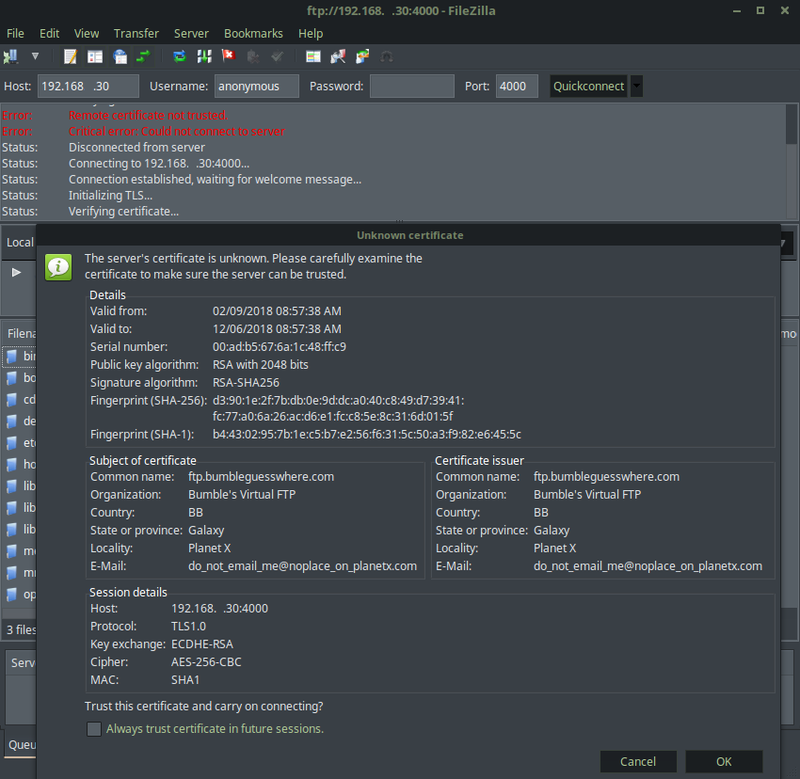 Filezilla does support FTPS (as well as SFTP), so we will be using this client to test the SSL connection. We are going to use FTPS for practice with SSL certificates. It never hurts to learn a new Linux skill. Certificates are created using the program openssl, so make sure that openssl is installed on your system. We will generate a certificate for each FTP virtual host, so we need a place to store them. Create a directory that will hold all certificates and keys. We can place the keys anywhere, but it is best to locate them in a root-level directory to help prevent access by casual users. 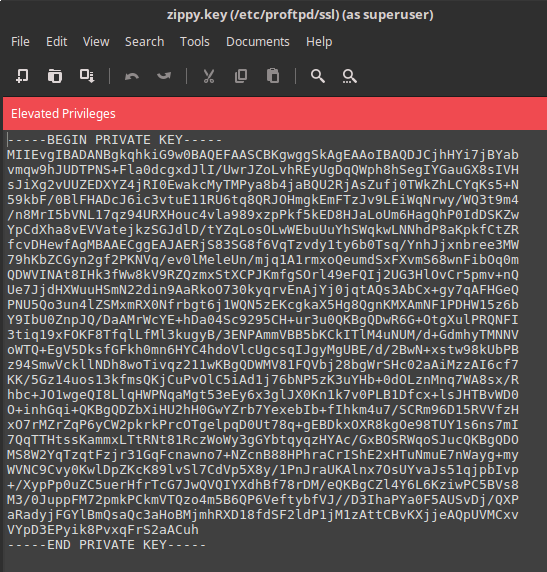 By using a dedicated directory in /etc/proftpd we can see immediately that these keys must be used for proftpd. Let’s start with the zippy virtual host. We will use openssl to generate a certificate and a key (two separate files). the certificate follows the X.509 public key standard (the same used for HTTPS). Be root to perform this action so the certificate and key can be stored in /etc/proftpd/ssl. You will be presented with an information questionnaire regarding your organization. For a self-made key, feel free to enter any fictitious information you like. Most of the certificate information is metadata regarding your organization. 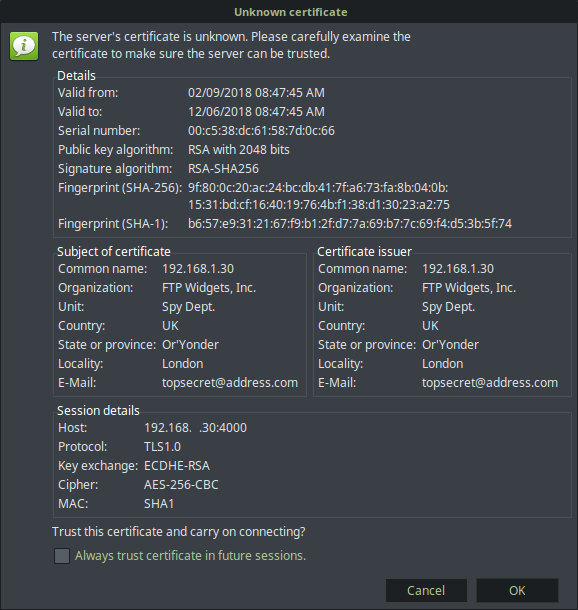 This information is readable by anyone who opens your certificate, and it will be presented to the user upon the initial login to your FTP server. The other options, such as -days 300, set an expiration date for the certificate. After 300 days, you must generate another. Let’s do the same for the bumble virtual host. We could use the same key for both servers, but this is better security. If one certificate/key is compromised, its certificate cannot be used to gain access to the other server. For added security, set the permissions so only root may read and write the certificates and keyfiles (proftpd also requires this for the certificate file). Change permissions from 644 to 600 so only root may read and write the files. Make sure root is the owner of the certificates and keyfiles. Have you ever wondered what a certificate looks like? Go ahead and open the certificate and key files in a text editor to see what they look like. They are simply text files containing binary data encoded using Base64, so they can be opened in any text editor. Use sudo to open them. Do not edit either file. 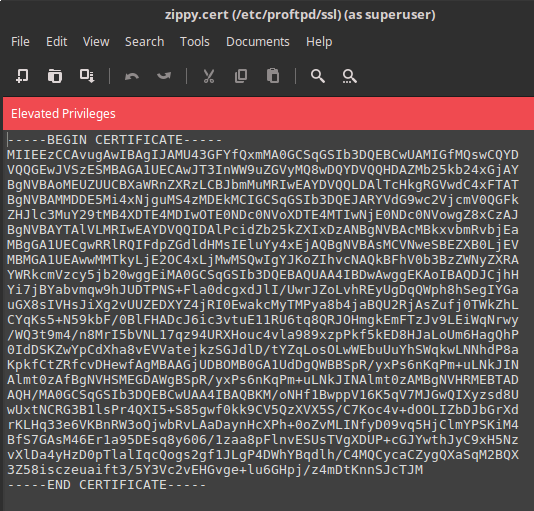 zippy.cert certificate file. Base64 encoded data can be opened in a text editor. The entire certificate is contained within BEGIN CERTIFICATE and END CERTIFICATE. Your certificate will be different. zippy.key private keyfile. Like the certificate, this contains the binary private key encoded as Base64 text within BEGIN PRIVATE KEY and END PRIVATE KEY. Do not modify. These files are shown here for example purposes, so they are useless. However, keep your certificate and keyfile private. Now that we have the certificates and keyfiles, we need to tell proftpd to use them. Open proftpd.conf for editing. This enables SSL/TLS encryption and requires that it be used for control and data communication. All logins will encrypt the passwords in addition to encrypting all data transfers. Include /etc/proftpd/tls.conf tells proftpd to add this configuration file to the existing proftpd.conf configuration for extra TLS-related settings. Find the the following two lines, and comment them out if they exist. Arguments might appear after the directives. They are irrelevant. These directives tell proftpd which certificate and keyfile to use the FTP server. We will specify them separately for each virtual host. Save and close tls.conf. Make sure to use absolute paths to the certificate and keyfile to avoid any ambiguity. Wherever you placed the files on your system is the path you must use to each. All anonymous logins to Zippy will be encrypted using an X.509 certificate. Do the same for the bumble virtual host, but specify the path to bumble.cert and bumble.key. Note: There is an intentional goofup in Bumble’s VirtualHost block above. It involves certificates. Can you spot it? We will catch it later. If there are no errors in the configuration files (proftpd.conf and tls.conf), the FTP server should run with both virtual hosts active. 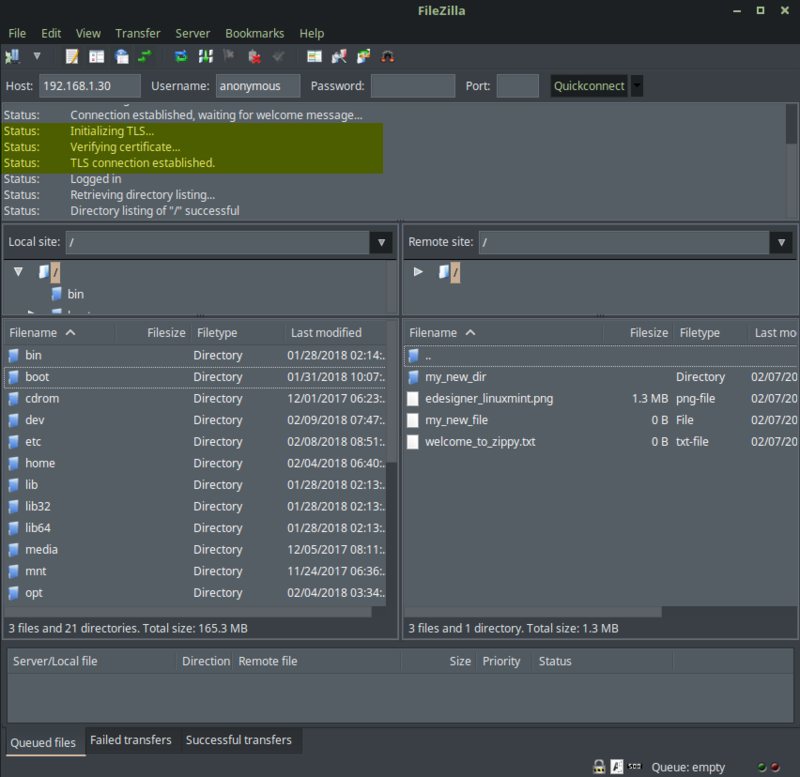 Open Filezilla (if open, close it and reopen because Filezilla sometimes caches an FTP session). Start by testing Zippy. Enter its IP address without any port (default is port 21). We should see something different this time. 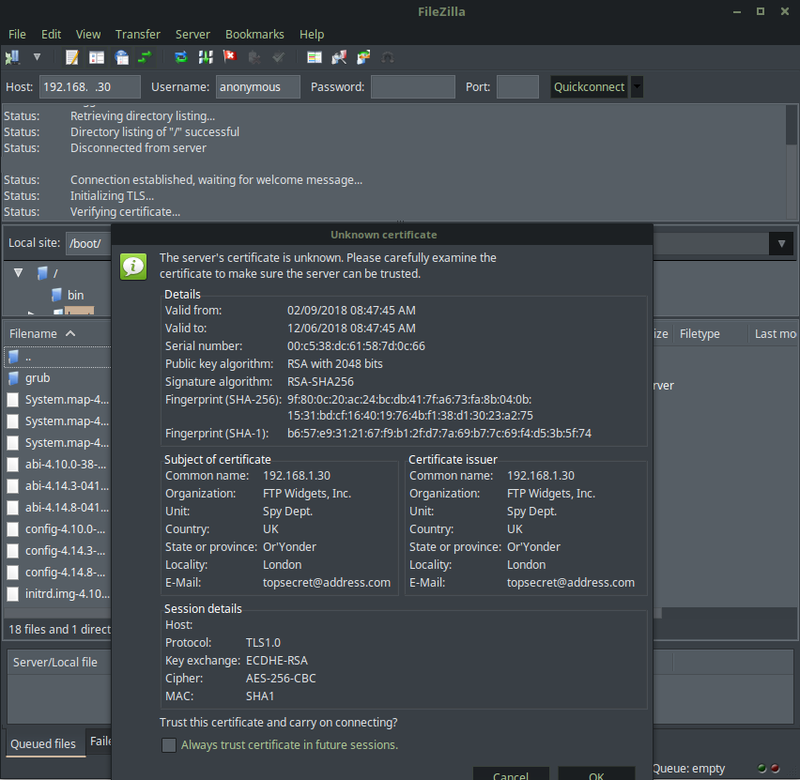 Certificate Prompt in Filezilla. TLS has been enabled, and it asks the user if this certificate can be trusted to encrypt the FTP session. Do you trust this certificate? Normally, a trusted third-party certificate authority would generate a certificate for our FTP site, but since we made our own for zippy, we see a dialog regarding an “Unknown certificate.” This is why Subject of certificate (remember the certificate questionnaire when the certificate was generated?) and Certificate issuer match each other. Do we trust it? Yes, of course, we do. Click OK.
Also notice that the Filezilla status text changes to “Initializing TLS…” and “Verifying Certificate…” This is normal. The certificate must be accepted in order to protect a user’s login credentials. Status text shows that a TLS connection has been set up between the zippy FTP virtual host and Filezilla. All commands and data are encrypted. A small padlock (indicated by the red dot) at the bottom of Filezilla shows that the connection is encrypted. Clicking the padlock displays the certificate details. Zippy works, so log out. Now, let’s try to connect to bumble’s virtual host. Since bumble’s server is listening on port 4000, we must enter 4000 in Filezilla’s port field. Logging into Bumble’s FTP…but we have a problem. This is zippy’s certificate. Why? Oops! It turns out that copying and pasting directives from Zippy’s virtual block to Bumble’s virtual block resulted in the same certificate for both. Let’s change that by specifying the paths to bumble’s certificate and keyfile. Bumble before pointed to zippy’s certificate and keyfile. 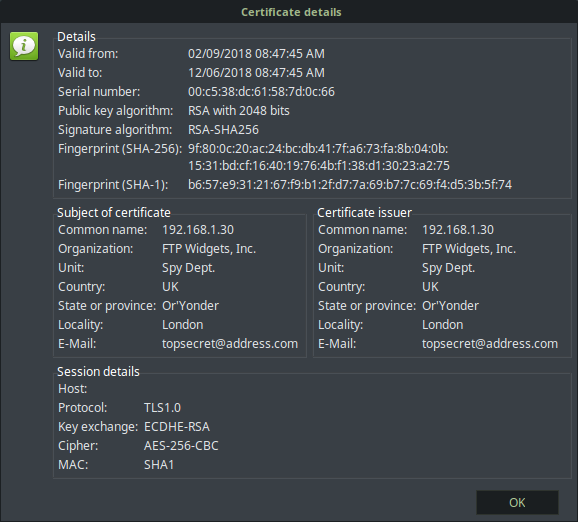 Bumble after now points to the correct certificate and keyfile. Even though proftpd started without errors, it did not catch this mistake. It demonstrates that we can use the same certificate and keyfile for more than one virtual host. Save the changes and restart proftpd. Now, try logging into Bumble again. Much better. We now see Bumble’s certificate when we try to connect to the Bumble virtual host at port 4000. Not all FTP clients support FTPS. This is discovered mostly through trial and error. Or virtual hosts are configured to require a TLS connection, so if a client does not support it, then no connection is allowed. 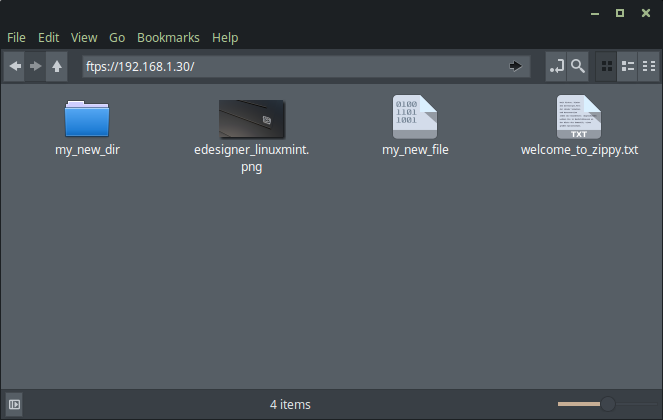 Nemo (the default file manager in Linux Mint Cinnamon), for example, supports both SFTP and FTPS. To connect using Nemo, enter ftps://192.168.1.30 (for zippy) or ftps://192.168.1.30:4000 (for bumble) in the location entry bar. You will be presented with a certificate confirmation. 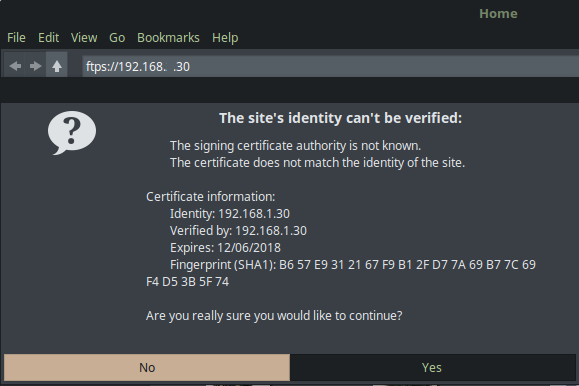 Nemo in Linux Mint 18.3 Cinnamon asking the user to confirm the TLS certificate before connecting to Zippy’s FTP server. Nemo successfully connected to Zippy FTP using a TLS certificate. Notice that Nemo requires ftps not ftp when specifying the protocol in its location bar. If you try to connect to an SSL/TLS required FTP server using ftp://192.168.1.30, then this error message appears. Specify ftps://. As of now, we have ProFTP running two TLS-encrypted virtual hosts that accept anonymous logins without passwords. TLS is required or else no connection is allowed. More virtual hosts can be added at different ports, and there is a wealth of options to explore that will allow you to fine-tune ProFTP to your needs. Two reasons: for practice and to protect regular logins. Even though the two virtual hosts constructed allow password-less anonymous logins, they also allow regular, non-anonymous users to log in. These user accounts do require real usernames and passwords, which could cause trouble if sniffed, so they must be protected. SSL/TLS certificates provide that protection. Of course, ProFTP allows you to limit user logins too, but this enters the realm of custom configuration for you to explore. This entry was posted on February 9, 2018, 4:47 PM and is filed under linux. You can follow any responses to this entry through RSS 2.0. You can leave a response, or trackback from your own site.